Since 1966, AAPA’s annual Communications Awards Program – sponsored by the AAPA Public Relations Committee – has recognized excellence in the products, programs and services that public port authorities design and produce to meet their public relations and marketing goals. In June, a group of 46 professional public relations practitioners from the Washington, D.C. area cumulatively spent 180 hours over three weeks judging 15 classifications of entries in AAPA’s 2015 competition, ranging from advertisements and periodicals to videos and websites. Upon completion of the judging, entries from 25 seaports scored high enough to be recognized at AAPA’s 104th Annual Convention and Expo in Miami, which runs Nov. 2-4. Georgia Ports Authorities’ Annual Report is the GPA’s yearly business update to stakeholders, including federal, state and local legislative officials, along with community leaders and port clients. The report highlights GPA’s year-over-year growth and its continued focus on customers. Change on the Everett waterfront came at lightning speed since the European settlement of the land. From a raucous union town with lumber and shingle mills, to a key role in the commercial fishing and boat building industries, Everett has a story to tell. In early 2015, the Halifax Port Authority released the results of the most recent economic impact report. 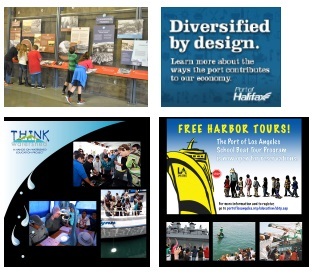 The Port of Los Angeles provides Think Watershed hands-on, science-based boat field trips to fourth through seventh grade classes that teach about the importance of environmental stewardship and sustainability in the maritime environment directly supporting Port of Los Angeles educational endeavors. The Port of Los Angeles School Boat Tour Program provides free one-hour educational boat tours to school groups (fourth grade through university programs) to demonstrate the importance of world trade; its economic impacts; career possibilities; security, environmental and community initiatives; and other requested topics of interest in an age appropriate and stimulating way. The Port of Long Beach Education Outreach Plan has been updated to build awareness and understanding of the Port of Long Beach and advance development of a skilled workforce that supports international trade and goods movement by creating and implementing a comprehensive program of events and activities focused on students in Long Beach-area schools. The ‘Better Together’ campaign, which employs the phrase "Better Together" after two short descriptive lines of copy, recognizes the importance the Port of Long Beach places on teamwork and partnership with its various trade and community constituencies. The Ports of Indiana is a unique port system with three public ports – one on Lake Michigan and two on the Ohio River – as far as a six-hour drive apart. It’s impossible for anyone to physically stand on a dock and see all the port’s operations, so Portside magazine provides an overview of activities at all three ports that isn’t available to stakeholders in one community. The industry subscription newsletter, Tie Lines, is produced by the Port of Long Beach and distributed monthly free of charge via email to a subscriber base of approximately 2,200 stakeholders. 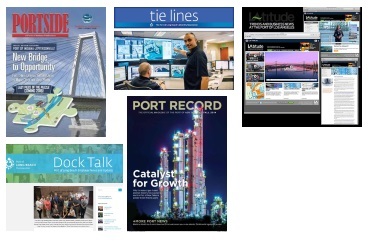 The Port of Los Angeles has created a unique electronic publication specifically targeted to its maritime stakeholders – LAtitude. 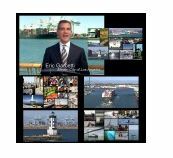 Dock Talk, the electronic employee newsletter for the Port of Long Beach, is an excellent tool for keeping the port’s more than 500 employees at several different locations in the loop. 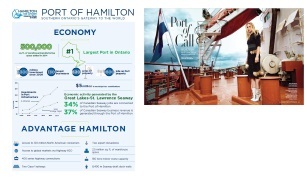 Hamilton Port Authority (HPA) identified a need to summarize its most important and most requested statistics for a range of stakeholder audience, including government, media, community organizations and HPA staff. HPA chose a simple, two-page infographic as an effective format that is inexpensive and quick to produce, and delivers the port’s critical information in an engaging way. The Port of Palm Beach served as the backdrop for a high-fashion photo shoot for the September 2014 edition of Palm Beach Illustrated, an edition titled The PBI Awards: The Best of The Best. The shoot resulted in a 12-page spread titled Port of Call – Hot off the fall Runways: Fierce, edgy looks for all kinds of weather. To move forward Port Canaveral’s initiative to increase cargo activity, including container business, the port authority purchased two ship-to-shore post-Panamax container cranes from the Port of Savannah. The public was invited to witness their impressive arrival by barge at their new location on the north side of Canaveral Harbor. Because of its status as a major regional economic engine and international standard bearer, the Port of Long Beach’s annual State of the Port event is closely watched by both industry and civic leaders. It highlights recent accomplishments and milestones and sets the tone for the port for the coming year. The speech and accompanying PowerPoint presentation and video in this entry were repurposed for a variety of future presentations. The Port of Long Beach adopted the landmark Green Port Policy in 2005, which has succeeded because of the support of port customers and industry stakeholders, who have been partners in the port’s progress toward environmental goals. The port believes they richly deserve a tribute, which is why the Green Flag Awards were introduced in 2007.The Green Ship Award was added in 2013, and in 2014, the event was renamed to incorporate both awards and allow for future additions to the awards lineup. Thus, the Port of Long Beach Environmental Achievement Awards was born. The Lunar New Year Festival was a first-time special event held on February 21, 2015. This new event was created to join in the celebration of the Lunar New Year which is honored by many cultures that celebrate Lunar New Year and to educate about the Port of Los Angeles along the way. The port attracted 3,000 guests to the Lunar New Year Festival and considers it a huge success. STEM – Science, Technology, Engineering and Mathematics – is a major facet of education and workforce development in the nation, state and city. The Port of Los Angeles workforce is comprised of many STEM careers. This year, for the first time, the Port of Los Angeles hosted a free STEM community event to show the community, particularly harbor area youth. In August 2014, 10 tall ships and one gigantic rubber duck made the news all over the country as the Tall Ships Festival LA took place at the Port of Los Angeles. With 277,000 visitors over a five-day period, the Tall Ships Festival was the Port of Los Angeles’ most successful event to date. The Port of New OrleansMaritime Workforce was a three-hour event to facilitate the introduction of community stakeholders in the New Orleans region and the maritime industry to one another. Three panel discussions focused on trade, transportation & logistics, career education, economic and workforce development respectively. This is the Port of Los Angeles' general information video. Port of Long Beach – 2015 State of the Port PowerPoint PresentationBecause of its status as a major regional economic engine and international standard bearer, the Port of Long Beach’s annual State of the Port Address is closely watched by both industry and civic leaders. It highlights recent accomplishments and milestones and sets the tone for the port for the coming year. The content of the speech and accompanying PowerPoint presentation in this entry are the communications bellwether for the months ahead and are repurposed for a variety of future presentations. Belledune Port Authority – Belledune ... Unlimited! Online marketing has become one of the most innovative, efficient, and effective methods of promoting a business. The Port of Belledune website, www.portofbelledune.ca, is anticipated to be the first point of contact that most people experience with the Belledune Port Authority. With the development of the Port of Hueneme’s strategic business plan and its rebranding and renewed communication strategy of 2013, the new port website has become a significant communications channel for the engagement of its three key audience segments: community, industry partners, and internal partners. The port believes the updated site represents a vast improvement over the previous site, which had become outdated and unable to reflect the port’s renewed vision and mission. In addition to the Excellence award winners described above, many ports are also being recognized this year for winning one or more communications Award of Distinction and/or Award of Merit certificates in AAPA’s 2015 communications competition.